Very recently, there have been numerous debates about how fintech startups are gulping a large chunk of investment in the Nigerian ecosystem. Well, the large market available makes it understandable. Here is another testament. In a bid to further drive financial inclusion, the mCash challenge seeks to support this market to explore the solutions that will accelerate the on-boarding process for the unbanked population of Africa. Quite a huge population, to be candid. There is a very dire need to improve Financial Inclusion, and this is very well understood. What is baffling is despite the rapid upward spiral in the establishment of FinTech ventures, there is still a lot left to be done. They have highlighted certain formidable barriers to inclusivity in Africa and these include; Access to education, communications services, financial and banking services pose special challenges. The barriers also include distance from a financial service provider, lack of necessary documentation papers and lack of trust in financial service providers. 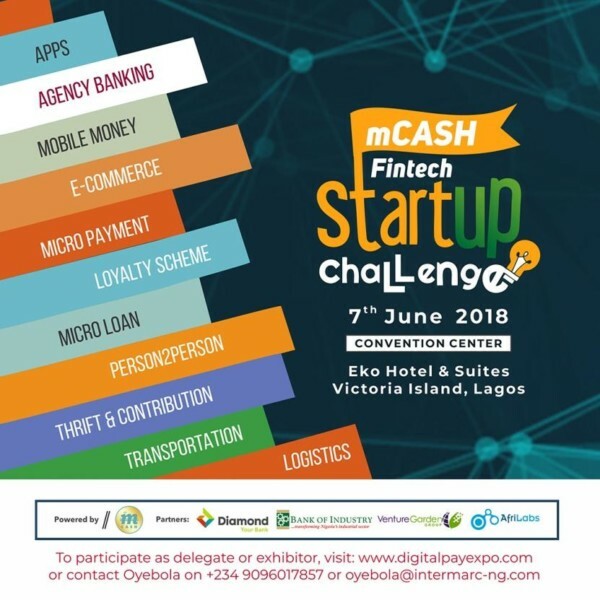 This year, 2018 marks the launch of the mCash Fintech Start-Up Challenge, with an aim to Build Financial Inclusion. This is a challenge that will offer cash prizes and recognition to individuals, teams of individuals, corporations, and nonprofit organizations with the best mobile applications (apps) that allows Nigerians make smart financial choices and beer access financial services. Incubation – Training, mentors and investors to help accelerate your business. Networks – The program is rich in partners with a strong local and international network of mentors and investors. You want to apply? GO HERE. Deadline is set at 23rd April. The Demo Day at DigitalPayExpo 2018 is 7th June. Funding Opportunities FinTech, mCash FinTech challenge. permalink.